If you like to drizzle caramel over your cinnamon roll then this is the perfect flavor. That's exactly what this flavor taste like. It will bring back delicious memories to your taste buds. They'll be thanking you. 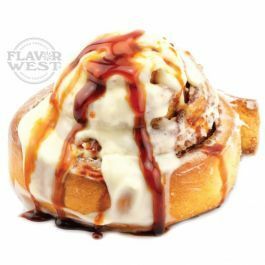 Type: Caramel Cinnamon Roll Water Soluble Flavoring. Ingredients: Natural and Artificial Flavoring and Propylene Glycol. USP Kosher Grade Flavoring. Usage Rate: 15-20% for E-use. Flavor suitability: Desserts, pastries and baked treats, yogurt, ice cream, candy and more. Specific Gravity: 1.04 No Returns on Flavoring.